2 Autogramme und 2 Relic Cards per Box !!! Produktinformationen "2014 Topps Gypsy Queen Baseball Hobby Box MLB"
- Black Jumbo Swatch Parallel: Sequentially numbered to 25. - Gold Jumbo Swatch Parallel: Sequentially numbered to 10. NEW! - Silver Jumbo Swatch Parallel: Numbered 1/1. NEW! - Black Parallel: Sequentially numbered to 10. - Silver Parallel: Sequentially numbered to 5. NEW! - Red Parallel: Sequentially numbered to 49. NEW! - Gold Parallel: Sequentially numbered to 25. NEW! - Green Parallel: Sequentially numbered to 10. NEW! - Purple Parallel: Numbered 1/1. NEW! 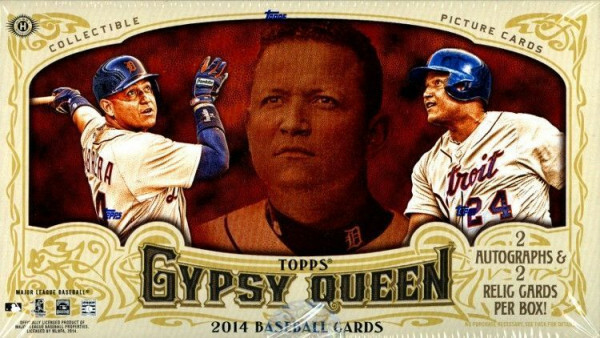 Weiterführende Links zu "2014 Topps Gypsy Queen Baseball Hobby Box MLB"
Fanbewertungen für "2014 Topps Gypsy Queen Baseball Hobby Box MLB"